"ManeGait will be hosting the ManeGait Country Fair on April 29, 2017. Modeled after old-fashioned county fairs, the event will feature wholesome fun for the whole family with carnival games, pony rides, petting zoo, music, food, shopping and more! It will be held on ManeGait’s 14-acre property in McKinney with a covered carnival in our 25,000 square foot riding arena. The ManeGait Country Fair is expected to draw attendance from 1,000 adults and children from surrounding cities." "Our Everman Area Retired School Employees Association 2nd Annual Craft Fair will be Saturday, April 29th from 9:00 am until 3:00 pm at the Everman City Hall Annex building, 213 Race Street, Everman, TX 76140. There will be NO entrance fees." 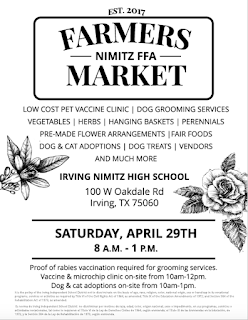 "Nimitz High School has several student run enterprises that will be on-site of the Farmers Market to offer their services. 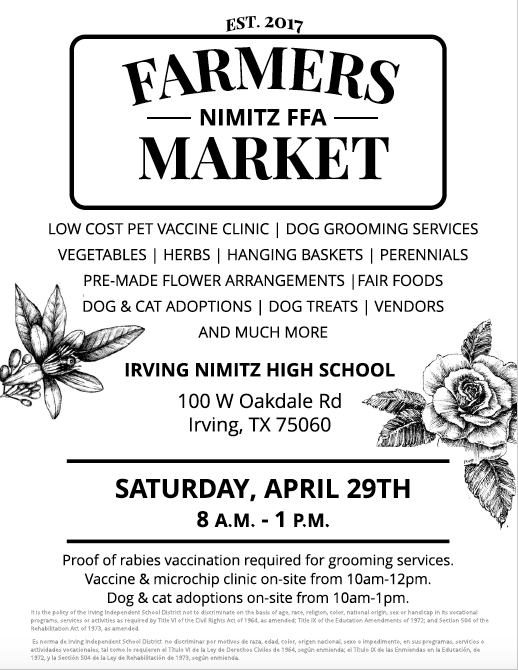 Nimitz Pet Care will be open to community members and offer grooming services, nail trims, and baths (owners must bring proof of rabies vaccination). Nimitz Floral Design Studio will be selling pre-made fresh and silk flower arrangements. Nimitz Horticulture will be hosting their spring plant sale out of the school greenhouse and the new community garden will be open for exploration. Additionally, Nimitz Culinary will offer a variety of street foods and refreshments for sale. Outside agricultural and craft vendors from the community will be invited to participate in the market as well." "Join us at the Mansfield High School Band Boosters' Mansfield Market. Saturday, April 29, 9am - 4pm. *Vendor Fair* Food Trucks*Bounce Houses* Fun for the Whole Family!" "Come join the Fun in Downtown Midlothian at this Spring's Midlothian Wine & Arts Festival. The festival is free and there is tons of shopping at 50 exclusive artisans, crafters and boutique sellers, plus food and entertainment. Join the wine walk and visit 16 wineries for only $25 which includes a Wine Bag, Glass and special gift." "Looking for something to do on a Sunday morning/afternoon? Texas Paw Care in Ft Worth, TX is hosting a Pop Up Market Craft Show with Frogs Event and Business Building Planning Services. Come out and browse, visit and shop from local crafters who handmake items to sell such items as handmade soaps, crotchet items, paper craft items,and home decor just to name a few along with a few Direct sales people - such as Avon and Pampered Chef. There are several businesses in the vicinity of our Pop Up Market Craft Show that are also going to take part in our event and all we are missing is YOU!" Cross street is 377/Old Denton Rd in Watauga, TX. "Mi Ranchito farmers market, Open every weekend from 10-4 pm We offer fresh produce local honey fresh eggs, homemade hot salsas, food trucks with Tamales, Corn in the Cob and delicious Tacos and more!"